Since 1998 (J Hall et al, Human Reproduction) it is accepted that IVF laboratories are at risk of environmental contamination from harmful Volatile Organic Compounds (VOCs). 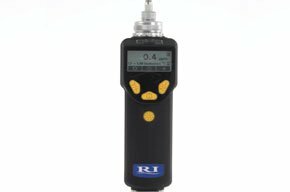 Exclusively from Research Instruments comes the RI VOC Meter for detection of VOCs at very low levels. It can be surprising where VOCs are found. In field tests we have found VOCs present in laboratories, incubators, incubator gas tubing and lab cabinets. We have also found VOCs present in laboratories where VOC removing filtration was in use. Why use the RI VOC meter? Simply start the device and use to sniff out areas of high VOC. An audible alarm will sound in areas where VOCs are higher than recommended and the concentration of VOCs present will be displayed on the screen. For added protection, the unit can be wall-mounted and VOC levels logged continuously. The detection is performed by a technology called Photo-Ionisation Detection (PID). The air is drawn into the detection chamber by a pump. UV light is used to ionize the molecular bonds in any chemicals that are present. These icons are electrically conductive and the meter detects the current that flows. The more contamination, the more conductive the air becomes. The threshold level of toxicity of Acrolein for mouse embryos has been established as 0.58ppm when dissolved in media. International consensus provides guideline limits for Indoor Air Quality (IAQ) in the range from 0.10 to 0.65ppm depending on location. Field experience suggests the 0.5ppm indicates potential IAQ contaminants in laboratories.